Floating from divine to destruction, the road to hell is paved in good intentions. On my quest to enlightenment, MMY is certainly an influential component. After all, I exhausted the entire online archive of his video’s available on YouTube.com — just a fraction of the total catalog of footage in existence. Entering into the sphere of Vedic philosophy post-Maharishi, it’s not reasonable to expect people such as myself to drift into the light of his wisdom in the same manner as those who walked at his side. Most of the negative stories about the man fall by the way side in my eyes. As I’ve mentioned in my entry on my MaxiMUM Error Choosing MUM, I know first hand how success, fame, and wealth spark criticism and scrutiny — just google any Hollywood A-lister. While I object to some aspects of his ideas and teachings, I find the collection on the whole to be inspirational. When you go global with a movement, however, your faced with difficult decisions which are largely sociopolitical as the aim is to unite many different people who believe in many different things, and consolidate their paths into a streamlined effort. It gives rise to the notion of private faith v.s. public policy. This is much like in the field of parenting, where sometimes a parent may twist a truth for the long term advantage of the progeny. On the other hand, understanding marketing constructs such as branding, and the subsequent goal of brand salience, campaigns are often reduced to attention seeking tactics to gain notoriety. This is much like when Russell Simmons made reference to “Candy” when reflecting on some of Hip-Hop music’s more socially deviant messages in his interview with Tavis Smiley circa 2005 — the abundant drug references, flashy cars, scantily clad women, fortune, and fame which seem to be the inherent ‘promise’ of the cultural lifestyle. It appeals to an already known desire of it’s followers to, in effect, lead them to a deeper more centralized idea of unity. Much of today’s Hip-Hop music harbors more and more philosophical thought which has proven far more intellectual than the shock tactics it had approached as it gained notoriety — though it started from a very pure and wholesome message of peace and unity. And might I add that I personally don’t favor Hip-Hop as my regular choice of harmony. Ideas such as Invincible Defense, Yogic Flying, Wealth, Immortality, and things of this nature have an ‘infinite’ appeal to prospective proponents seeking an escape from suffering through a spiritual quest beyond the mundane life in the physical realm of earth — it quenches an inner desire with hopes to lead to a fulfillment (enlightenment) — the end justifies the means. But once something reaches a mainstream proportion; salience; the candy begins to fall by the wayside in the face of overall social transparency. 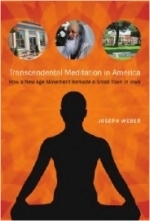 That’s where I see Transcendental Meditation in it’s role as a cultural ‘movement’ in the modern day. Meditation on the whole is transparent, even in western society. But the old trappings die hard, they continue to thrive within the social sphere of the founding grass roots purveyors who’s dispositions have become engrained in their daily function. But when does “Candy” go to far, beginning to decay the enamel of innocent people’s lives? Of this too I can explain, that the phenomenon seems to invert itself and become manifest in greed and struggles for power and control of peoples minds to fulfill the dangerous desires of a small ‘elite’ few — that people such as myself ultimately out wit through a keen propagation of truth that overturns the fallacy at the corpus of the once sweet propaganda. In the case of Maharishi University of Management (MUM) it becomes obvious when administrative complacency endangers the lives of the collective. Because movements lack accountability in their infantile stages, they often struggle to become responsible for their actions if and when they finally do succeed in moving from a social deviation into a social norm. It’s for this reason that so many movements typically collapse under the weight of their success — they fail to change with the direction of the tide, and become beached in their negligence. Take, for example, a TM retreat for health benefits which entraps participants in mold infested dormitories. Or the consistent gouging of students — and perhaps faculty — to hedge the overall fiscal irresponsibility of the underlying administration. Examine the crumbling buttressing of the field house infrastructure caused partly by age, but largely by lacking fundamental maintenance of its gutter system. Behold the buldge in the street that practically greets our visitors as it scrapes the underside of their vehicles. Further, the over crowded parking which inhibits the function of Dr. Kieth Wallace Drive, ultimately causing damage to the vehicles of its patrons — we think the fender benders are the fault of drivers, however, it’s the university damaging our vehicles. Or the lack of proper sidewalks throughout the campus, leaving pedestrians obstructing the street in transit. I almost backed into a certainly charming lady making haste to the dome via power-chair / scooter in my egress from the Golden Dome Market — she was saved by the bright flag adorned to her chair. As the door to enlightenment is always open, the university continues to sell keys. Other doors which should be open are restricted — or obstructed — from use, causing ambiguity in the event of a fire. Students and faculty are forced into quasi labor camps to sustain life, rather than focus on exceptional achievement. The education practically bankrupts anyone dedicated to the pursuit, a dangling carrot in the face of the botched logistics that I discus in my entry On Academic Logistics. The movement that once placed life on a pedestal now lackadaisically kicks it to the gutter. But again, allow me to reflect on the notion that on an individual basis it seems many of the proponents of the university — and movement at large — mean well.